If you’re thinking about buying a punch bag then you’ve probably thought about whether to get a standing punch bag or hanging punch bag (heavy bag). Like anything they do both have their pros and cons, but in regards to heavy bag training itself, whether it’s on a free standing or hanging punch bag the pros and cons are very similar. There is a difference between a standing punch bag and a hanging heavy bag in terms of how it can benefit your training. If you’re fortunate enough to have enough room for both in your house or garage or the gym you train at, then you should use a mixture of both. Further down the page we’ll explain what a standing punch bag is used for then you can compare it to what a heavy bag is used for. If you’re new to boxing training then hitting a punch bag is one of the most popular methods of training as it doesn’t require a training partner. Make sure you wrap your hands before you do any form of boxing training which is going to involve wearing boxing gloves. What Is A Standing Punch Bag Used For? Combination punching – Just like on the heavy bag, you can also practice a variety of combination punches on a standing punch bag. You’ll have to reduce the amount of power you put in your punches especially the cross otherwise the bag will either swing back and forth like crazy or tilt over. Technique – As you already know you can’t throw full power into your punches, so you’ve already taken your focus off power. Once you take your focus of power you’ll focus more on other factors such as speed and technique, practice throwing singular punches and returning your arm back to guard position straight away rather than dropping your guard which is a common mistake a lot of boxers make. Speed – As you’re unable to put as much power in your punches as you would for a hanging heavy bag, you can use the standing bags swinging back and forth motion to work on your speed. If you hit the bag with less power it’ll quickly return to the centre to enable you to throw your next punch. This will work particularly well with jabs as it’s not a power punch anyway, you can work on the speed of throwing multiple jabs. You can still throw hard hooks especially to the body without the bag falling over, but don’t throw a hook like a clothesline otherwise the bag probably will fall over and because it’s the wrong technique! Footwork – You can work on your footwork with any punch bag but I personally feel that footwork is more closely related to speed than it is to power. As you won’t be throwing your hardest shots with a standing punch bag, you can hit and move and really work on improving your footwork and coordination. Assuming you’ll be placing the bag somewhere you can move completely around it will also give you more space to manoeuvre whereas you can’t always move 360 degrees around a heavy bag as it might be restricted by the wall or the frame it hangs from. With a heavy bag as you’ll probably be working on more power than speed you’re going to have your feet planted a lot of the times throwing power shots which makes it harder to be quick and light on your feet. Fitness – Using a lot of movement whilst punching and not punching requires a good level of fitness especially if you’re going to be doing say 4 rounds, this is also really good for building up stamina and endurance. You can tailor your workout according to your level of fitness, and as your fitness gradually improves you can increase the number of rounds or decrease the rest time or increase the round time. Able to work on your combination punching. Able to focus more on technique as you’re not focusing on power. As you’re not able to throw your hardest punches, you can work on throwing fast punches. Utilise all the space around the bag moving clockwise and anti-clockwise to improve footwork. Hitting and moving a lot will increase your stamina and endurance. Doesn’t absorb punches as well as a heavy bag and as a result can have more wear and tear on your joints especially when throwing hooks. Easy to develop bad habits such as dropping your guard. Can’t put too much power in your crosses otherwise the bag will swing too much or fall over. 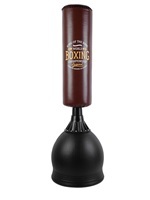 A very affordable and good freestanding punch bag perfect for beginners or professionals. 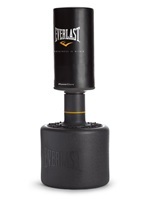 Without a doubt it’s the best freestanding punch bag for under £100. Perhaps not ideal if you’re looking to let your hands go and hit the bag full power with every shot, but it’s perfect for practicing movement and technique. Also, the height is fixed at 160cm which may not be ideal for taller users, but for the smaller guys out there it’s ideal! Narrow stable base allows you to work on the bag without the base getting in your way. Absorbs your punches with its 5cm thick EPE foam. Base can be filled with either water or sand. Rubber connector stand ensures greater durability. It’s difficult to walk past “Bob” without giving him a few punches! 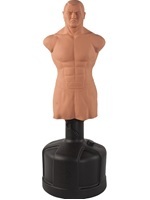 This lifelike mannequin is aims to make training more realistic, as his shape is quite similar to what a sparring partner would be like. Most bags have the same diameter from top to bottom but because of Bob’s shape you have a wider body and smaller head which helps you judge your distance better. Although the body can withstand powerful punches and kicks, the head is designed to bend so it’s quite floppy whenever you strike it in the head. So don’t expect to be landing hard shots to the head as there’s little resistance. 8 height adjustments ranging from 152 – 198cm. Heavy base weighing 122kg when filled with water. Allows you to grab the neck to practice knee strikes. As the maximum height of this punch bag is 170cm it’s probably better suited to slightly short users. This bag is not designed to take powerful punches as the flexible neck design makes it swings back and forth when you punch it, so it’s more ideal to practice evading the bag when it swings back in your direction. Overall it’s good for practising movement and evading getting hit but it’s not as good for combination punching, throwing power punches or body shots. Adjustable height up to 170cm. Base weighs 100kg when filled with water. The base won’t move when you punch the bag due to the neck design. Flexible neck design good for movement. 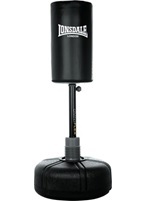 Solid heavy duty punch bag designed for heavy use, the height makes it suitable for most users with good stability as it’s not a very tall bag. Can be a little bit more tricky to set up as you can’t fill the base with water, you have to use either sand or gravel. Height 175cm making it suitable for most users. Wide bag diameter of 45cm. Made from durable synthetic leather. 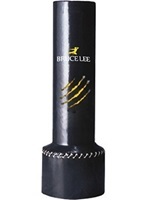 Equipped with a power transfer ring to minimise base movement when punching the bag, however not designed for powerful punches but more for speed and movement. With only a maximum adjustable height of 165cm, it’s not suitable for taller users. Adjustable height 132 – 165cm. Slightly wider base diameter of 63.5cm. Weighs 113kg when filled with water. Power transfer ring minimises impact and reduces base movement.